The General Purpose Computer System is the modified version of the Von-Neumann Architecture. In simple words, we can say that a general purpose computer system is a modern day architectural representation of Computer System. The CPU (Central Processing Unit) consists of the ALU (Arithmetic and Logic Unit), Control Unit and various processor registers. 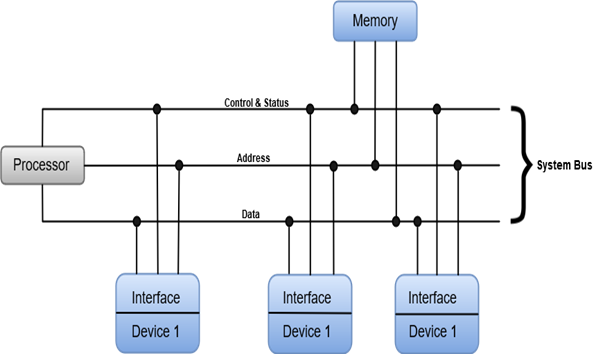 The CPU, Memory Unit and I/O subsystems are interconnected by the system bus which includes data, address, and control-status lines. The following image shows how CPU, Memory Unit and I/O subsystems are connected through common single bus architecture. However, practical systems may differ from the single bus architecture in the sense that it may be configured around multiple buses. Multiple Bus Architecture favors high throughput as compared to Single Bus Architecture. We will discuss Buses in more detail later in this tutorial.